A native of Ft. Lauderdale, Blades went on to the University of Miami where he was co-winner of the Jim Thorpe Award in 1987, given to the outstanding defensive back in the country. 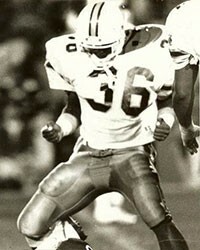 He was a consensus all-America at safety in 1986-87 and ended his UM career as the school’s all-time leader in interceptions (19) and interception return yardage. He also set school records for consecutive games with an interception (5) and total tackles by a safety. He spent 10 years in the NFL, including nine with the Lions who picked him third overall in the 1988 NFL draft. Bennie finished his career as the second leading tackler in Lions history. He played in the 1991 Pro Bowl and twice was named the Lions Defensive MVP.